It looks like we’ll get away with it this time. It’s not going to be blazing sunshine but our Derby & Dressage Show is all set to go ahead this Sunday at Hillsborough Farm. 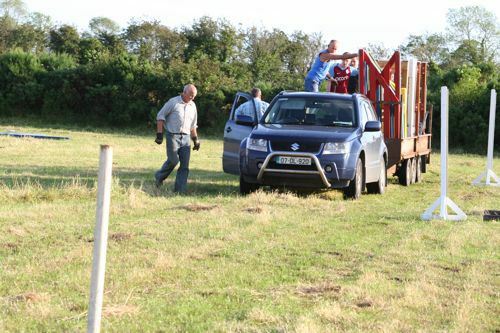 The work to make it all happen has already begun as Francis, Rachel, Damien and others haul jumps from the four corners of the county to our greenfield site near Ramelton. 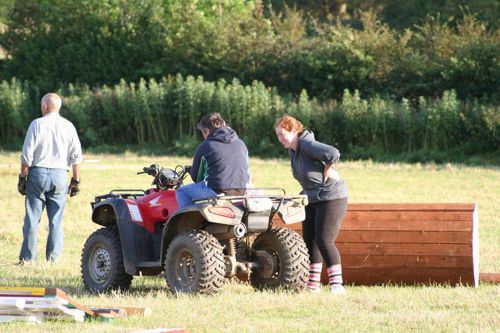 Formal course building and preparation of the show ground begins at 7pm this evening. Please come along well armed with energy, initiative and good humour. There’s a lot to be done. Louise, Rachel and John will be directing operations and one long evening’s labour should see the job completed. On Sunday, the most important task of all is to bring your horse and compete! If you don’t feel like jumping, ride a dressage test. Everybody can rise to that! All the effort becomes worthwhile when competitors enjoy the event. Most of the standard tasks such as entries, call-up, and both dressage and show jumping scribes have been allocated in advance (and a large thank you is due to our friends in East Donegal Pony Club for their part in the rota). However, there are countless tasks to be done on the day and everybody’s help will be much appreciated. Don’t wait to be asked — offer your services voluntarily. We’ll need plenty of hands in the arena. It’s large and generally Derby classes see few clear rounds so there’ll be plenty of poles to be picked up. Above all, come out and enjoy the social side of preparing the show, participating and spectating at what promises to be a wonderful event.